Vertical slow juicer with 400W power and two switching stages for the production of healthy fruit and vegetable juices without seeds or pulp. 60 RPM for gentle, "cold" juicing with extra-wide 8.5 cm diameter filler tube - suitable for large pieces or whole fruits. Includes two containers with 1 litre capacity and a practical cleaning brush. 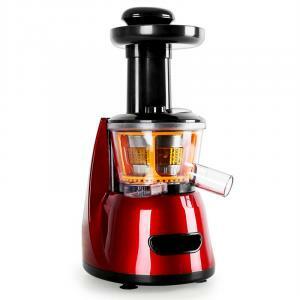 The Klarstein Fruitberry slow juicer gets every drop of nutrition from your fruits and vegetables. Start your day with a glass full of well-being -- press all kinds of fruit and vegetables into fine juices to delight your children, family and relatives with tasty vitamin bombs. Oranges, apples, berries, lemons, carrots, and tomatoes are just some of the ingredients you can press into delicious juices. Especially tempting are imaginative juice combinations such as cherry banana, strawberry mint, or apple melon. Due to the low number of revolutions - only 60 revolutions per minute - the fruits are not heated, nor are the vitamins depleted. Therefore, the nutrients contained in the fruit remain intact so as to have the most positive effect on the body. The juice yield is far higher than that obtained through conventional pressing processes, thanks to the latest technology. 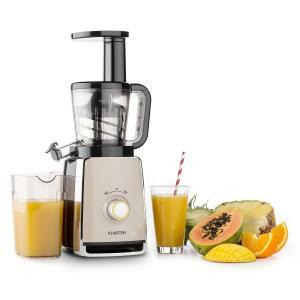 The 400-watt unit operates quietly and does not interfere with the preparation of fresh fruit cocktails, and is particularly powerful in juicing hard or large fruit and vegetable pieces. The Fruitberry juicer features an extra-wide 8.5cm filler tube, which can fit large pieces or even whole fruits so that you don’t need to spend time cutting fruit and vegetables into small pieces. The screw juicer pulls a large part of the material to be pressed on its own. In the event that fruits or vegetable scraps clog the juicer, the juicer can be run in reverse to clear the blockage. 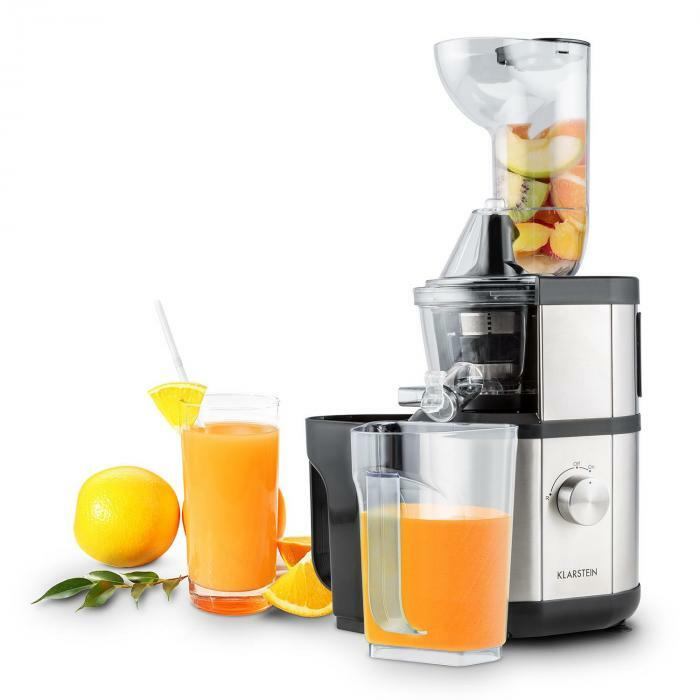 The extremely fine micro filter ensures that only juice ends up in the glass - any fruit residue or pulp is extracted and separated from the juice. This does not necessarily need to be disposed of: but can be used for desserts, energy nutrition or as a baking ingredient. Safety is a top priority: the engine will not start unless the feeder is mounted on the juicer and the safety lock is engaged. 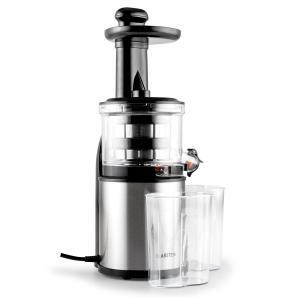 Four suction feet on the bottom provide the juice machine with a stable stance. Cleaning the Klarstein juicer is straightforward thanks to the detachable parts and detachable presser mechanism. 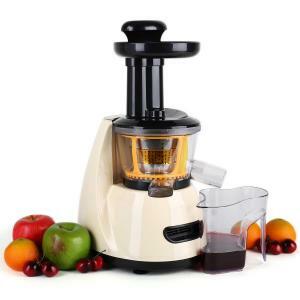 The Klarstein Fruitberry slow juicer is presented in a round, cohesive form, its fresh and modern character underscored by the stainless steel casing with black plastic elements. With compact dimensions, it can easily be stowed even in smaller kitchen areas. Available versions: stainless steel metallic, stainless steel red (item 10029378).